So, today I found myself rejoicing about the fact that I fixed a major issue with the schools network. 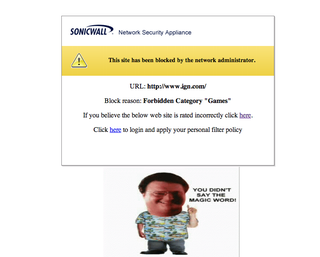 To celebrate, I added an animated gif to the firewalls default blocked page. It's the kind of thing I do. I won't tell anyone. I just want to see how long it takes someone to notice.